This post is titled "Catching, Not Fishing" and here's why. A good friend of mine has had his fishing time significantly cut lately and most of our trips to the local lake had not been worth the effort. He was tired of fishing and needed to do some catching, so we decided to target some perch at a lake where we had landed some sumos last ice season. I had been there a few days earlier with decent success, so I was confident we would do some catching. With the snow crunching beneath our feet, beards and eyebrows icing up with every breath, we were trekking across what felt like a frozen wasteland. Our goal was a small feed of perch and perhaps a football to catch and release, and knowing what lurked below the three plus feet of ice and snow was motivation enough to keep pushing on. With the sun breaking the horizon and temperatures below -30 (which has been the case for most of this season so far), heat and shelter were the priority. We set up shop not far from where I had fished days earlier, a good number of perch were caught that day with the biggest being fifteen inches, about ten or so pike were caught as well, some hooked so badly they had to be retained making for a good meal. That success was why I was back. 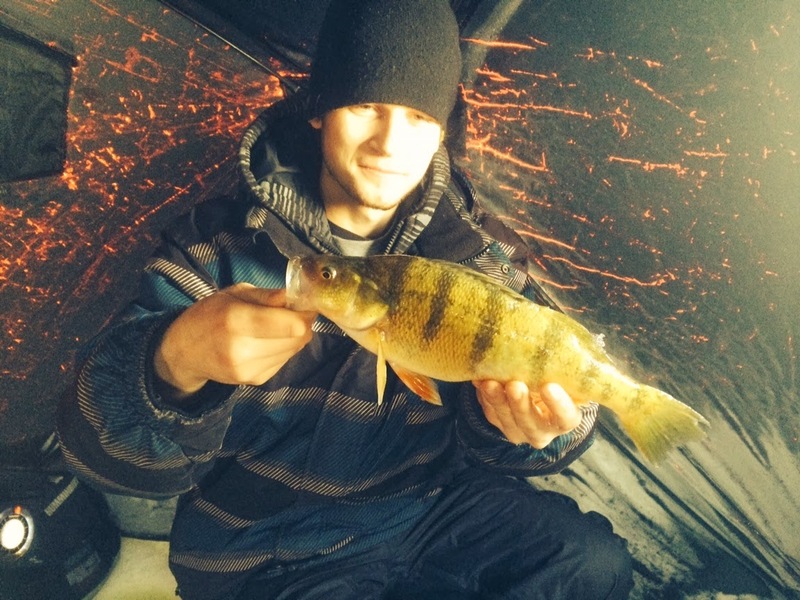 Not many people look at perch as a trophy fish but I truly do, as well as the two anglers I was with this day. 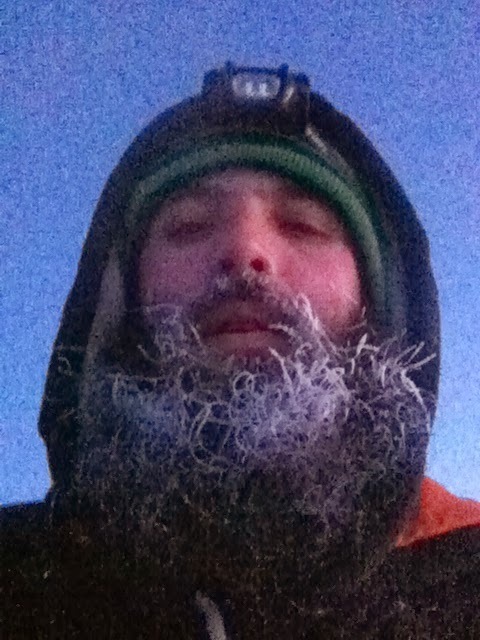 The auger cut through the ice giving us six holes in a shack formation and our pop up shelter was up in a flash. 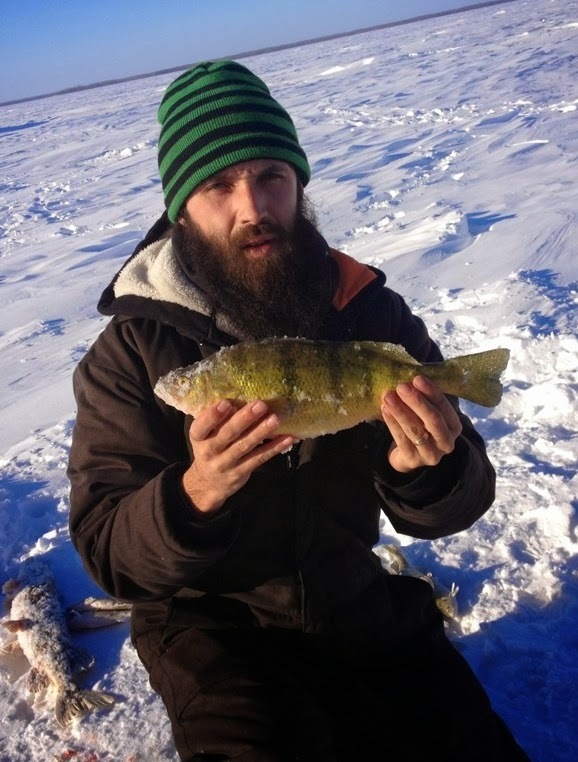 Within thirty seconds of dropping a lure down below, Jay had his first perch on the ice, a nice eleven inch eater. The action wasn't non stop, but as the schools came through you'd better hope you had at least one line down there. We had about eleven feet of water below the ice, with most of the fish in the bottom two feet., the occasional pike swimming at six feet. As is usually the case at this lake I needed to miss more than a few bites before my first solid hook up. A thick red mark showed up at six feet on the flasher and I raised my lure just above it, wham came the tell tale strike of a pike. The other two anglers reeled up their lines quickly as to avoid tangles and snags beneath us, it's common with the peeling runs of these 24 - 32 inchers on ultra lite or lite tackle to go where they want at first. After an enjoyable battle I finally forced the pike up the hole where we were able to get the hook out and send it back on its way. Temperatures made running and gunning impossible so we fired up the heater and hunkered down knowing that we couldn't stay on the school but would be warm waiting for them to come back by. And that they did. Frodo seemed to be out fishing Jay and I at least 3 to 1, easily catching and releasing 10 perch to my first three fish. He was using a few different set ups, one of which was a dropper rig, I plan on using one in the future. I was using a larger lure trying to target the sumos and because of my ultra lite rod lacking a bit of backbone, (it's great for gills and crappie however) I was missing some hook sets with some solid marks. Next time I will try a light rod with a sensitive tip but more backbone. All in all it was a great day on the ice with many lures and baits tried, most all of them successful in one way or another. We fished from sun up to sun down, less pike than my previous trip, but more perch, which is what we were there for any way. A couple 13 inch perch were the biggest of the day and they were sent back down to grow some more. The thing that made this lake rare is that the perch community had a long time to develop before they were noticed - including by Fisheries Branch. Given the abundant food source and large predators, some individuals in this population are larger than what is achieved in some lakes. 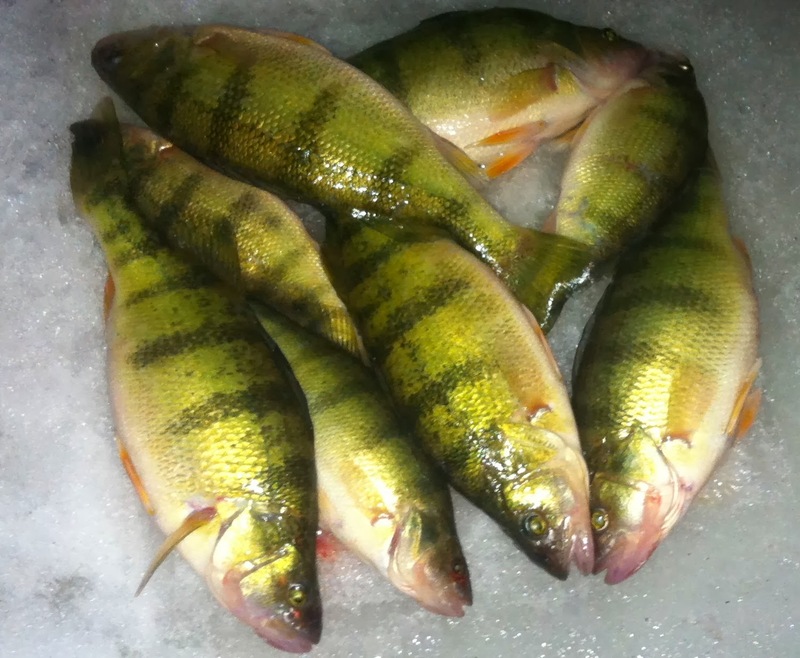 The word got out a few years back on the good numbers and huge sizes and it's been getting hit hard, with 9 out of 10 "trophy" sized perch caught being retained to eat by anyone lucky enough to catch one. Not us though, anything above twelve inches and usually below nine gets sent back, and if anyone does want to keep some, it's nowhere near the limit of 25 in our southern region.